At the request of a coworker whose out-of-town boyfriend was coming to visit for Valentine’s Day, I made her a batch of Valentine’s cupcakes. 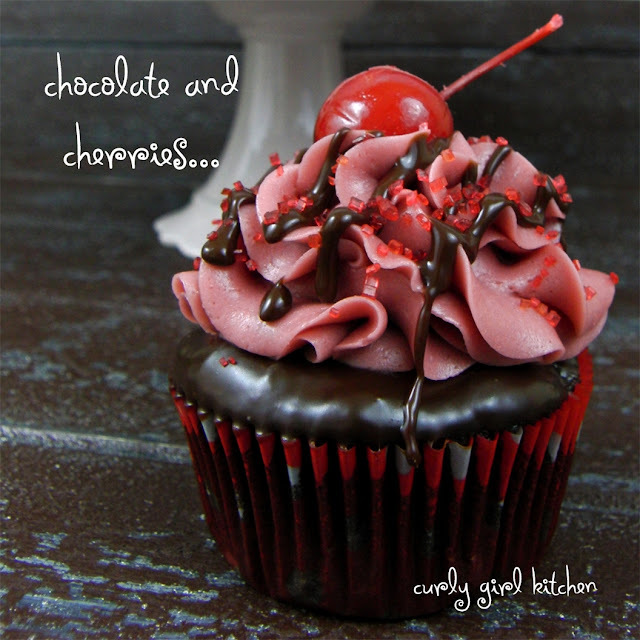 She liked my suggestion of something with chocolate and cherries, and so I decided on a “Chocolate Covered Cherry Cupcake” since this combination is very "Valentinesy". I started with a very moist chocolate cupcake (sour cream is the key ingredient for moisture) flavored with a little tart cherry juice. Then I dipped each cupcake in a coat of smooth bittersweet ganache to make them extra decadent. For the buttercream, I reduced the tart cherry juice down to a syrup, and after cooling it, I mixed it right into the buttercream. 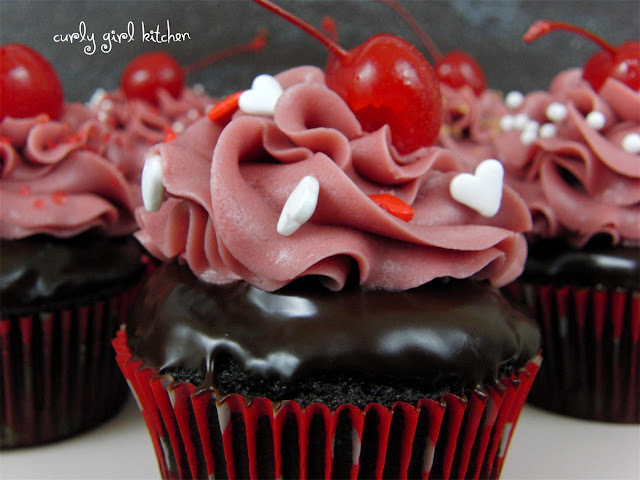 The cherry reduction gave the buttercream a beautiful dark pink color, and the tartness offset the sweet frosting perfectly. 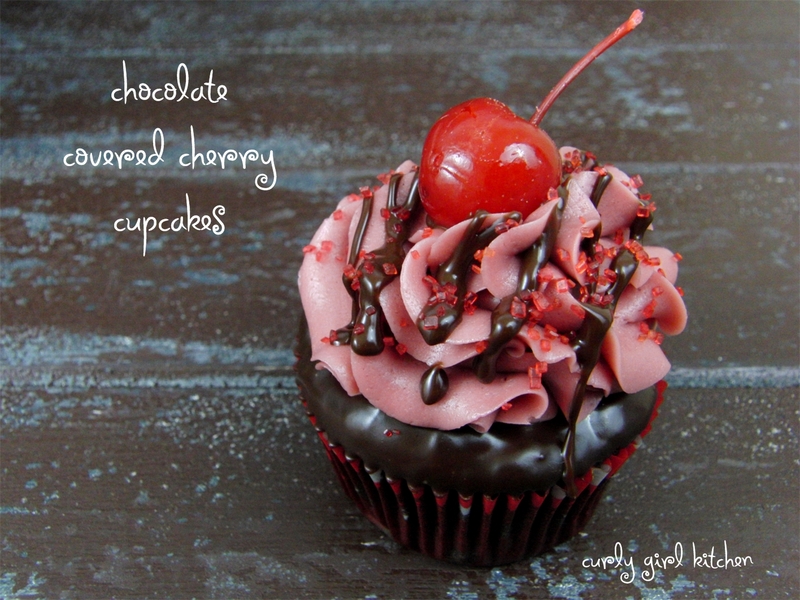 I finished each cupcake with a maraschino cherry, various festive sprinkles, and even a ganache drizzle on a few. I didn’t get to taste one of these, but I liked admiring just how pretty they were, and got rave reviews later on the finished cupcake! Place the chopped chocolate in a bowl. Pour the cream into a small saucepan and heat gently over medium low heat, just until bubbles form around the edges. Pour the hot cream over the chocolate and let stand for 3 minutes. Set aside, and let the ganache set for 10 minutes before piping on the buttercream. A few hours before (or the night before) making the buttercream, pour the cherry juice into a saucepan and reduce to 1/3 cup over medium heat. Cool completely. To make the buttercream, place the butter in the bowl of your stand mixer fitted with the whisk attachment. Beat the butter and cherry syrup (reduced juice) together. In a separate bowl, combine the powdered sugar and meringue powder. Add gradually to the mixer on low speed until mostly incorporated. Add the vanilla and a little milk to moisten the buttercream, then whip on medium speed for 4-5 minutes until very light and fluffy, adding additional milk as needed to achieve a smooth and creamy consistency for piping. Pipe onto the ganache-covered cupcakes and garnish with sprinkles. 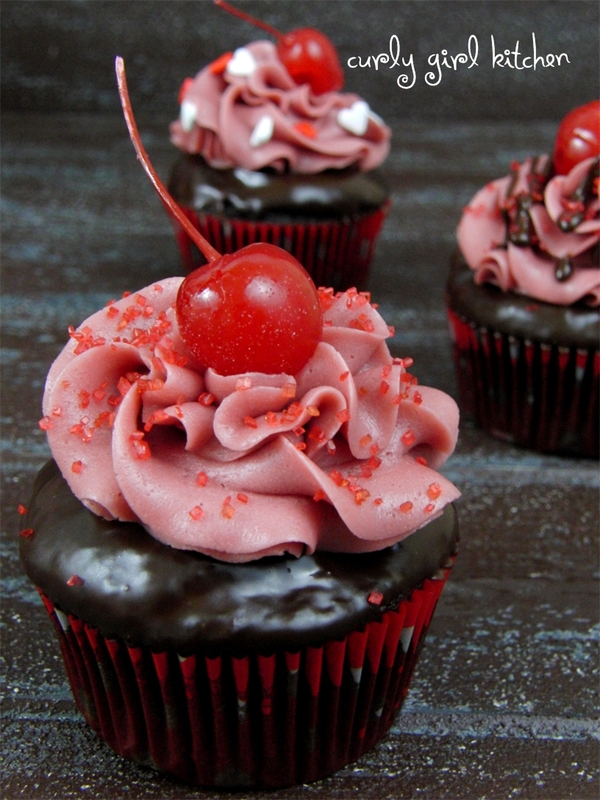 If you have any leftover ganache, you can drizzle that over the buttercream also.